In a consumer culture bored with flotsam and jetsam of its own making, Barbara De Pirro has created a life raft – her installation art, which is composed of discarded plastics and recycled materials. We caught up with the artist as she was preparing her installation for Spaceworks Tacoma, vortex plastica, at 912 Broadway. 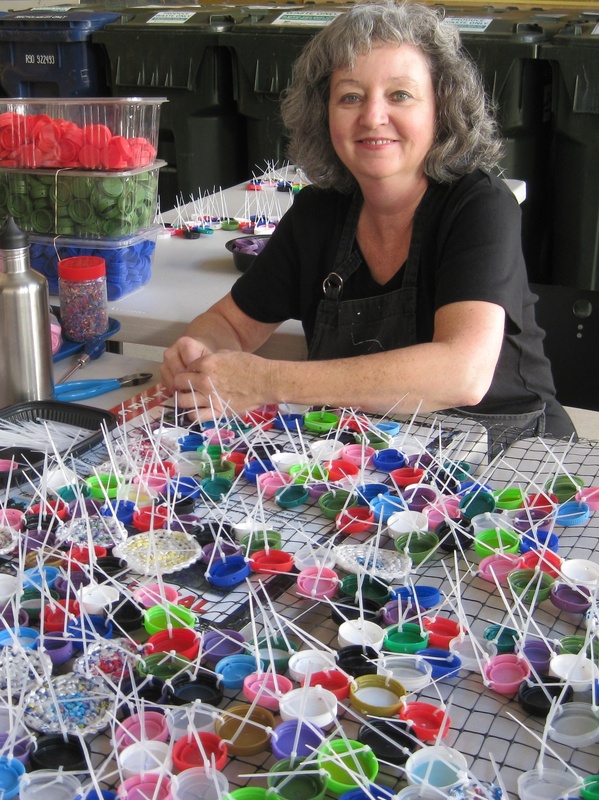 Hundreds of plastic bottle caps, separated by color in plastic bins, were being pierced and stitched onto black netting in a brightly hued shockwave. 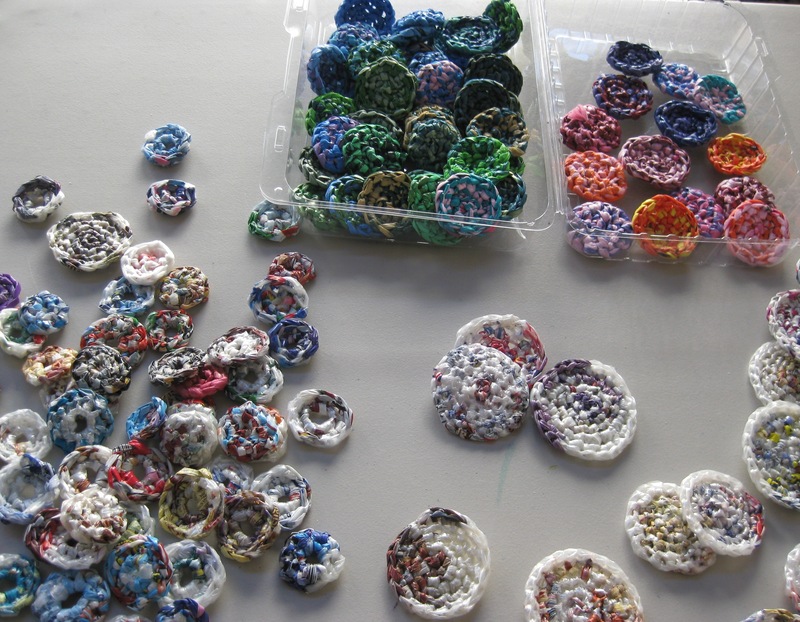 Plastic bags crocheted into patties covered a tabletop; others were crafted into long garlands that formed webs over windows or piled up on the floor. By coincidence, rows of green recycle bins lined up like sentinels behind De Pirro’s worktable – but these weren’t a part of the installation, just waiting for service at tomorrow’s Broadway Farmers Market. De Pirro, a recipient of a 2010 Artist Trust GAP Grant, says the installation is generating a buzz from passersby and will be completed in about a week. With its expert use of garden-fresh color (the expanse of recycled bottlecaps is mindful of a field of blooming flowers), the art piece has the power to attract, delight, surprise and repel (when it is discovered what the material is), in short order. No wonder – like a figment from a nightmare, vortex plastica was inspired by the North Pacific Gyre, which carries an enormous and deadly “garbage patch” of plastics and refuse that is perpetually locked in its ocean currents. Follow De Pirro’s work at www.depirro.com.